On November 14, 2016, the 7.8 magnitude earthquake changed the seaside town of Kaikoura’s landscape forever. A notable part of the damage was the (some 350,000m3 debris) slip on the SH1 which cut the town of from the rest on NZ and caused huge distress to the locals until a new path was made to access the town. 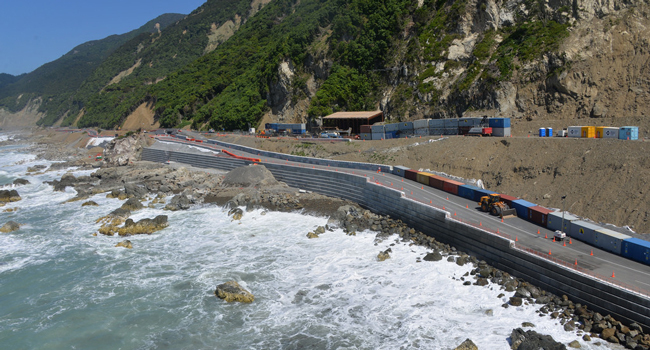 However wasn’t until 15 December 2017 SH1 could open due to the seawalls that had been put in place. Since mid-2017 Fletcher Reinforcing have been involved in supplying North Canterbury Transport Infrastructure Rebuild (NCTIR) with material for new bridges (road and rail) piling, tunnels and seawall and with the rebuild only about halfway through this is set to continue for another 12 months. The Christchurch Fletcher Reinforcing team has had a team of steel placers working on sites for the last 4-5 months helping install the prefabricated cages which has been an excellent aide to the project. The Christchurch has also been on call to work with NCTIR to deliver to very strict and unpredictable timelines. The seawall blocks are 1m(H) x1m(W) x2m(L) and in some places are as high as 9m. To the right you can see the old road which was originally on the coastline, showing just how much the seabed has risen since the earthquake. The reopening of the South Bay Marina on 14 November 2017 was also a significant milestone for the community and the tourism industry. After the earthquake, the whale watch boats were left stuck on the seabed due to it rising. Also, the boat ramps were interrupted for charter and private fishermen. Fletcher Reinforcing was involved in supplying mainly galvanised steel and mesh for the marina project. Given the short lead times available, we were able to supply galvanised Reid bar which we stocked so that NCTIR could reach their opening date. There were even a couple of trips with company Utes and trailers to help keep the project on target. 22,000m3 of material was dredged from Kaikoura harbour. The total estimated cost to repair the damage to the South Island transport networks corridor remains at $1.3 billion of which only half has been spent as of April 2018.